To close out this week of discussing and releasing decisions, I’m going to turn to the real heart of Fletcher — our students, staff, and faculty. In this third post drawn from a student-compiled feature, meet the community! What are you studying at Fletcher? I’m currently studying negotiation skills, development economics, and how to analyze regional and internal conflicts at Fletcher, while taking Arabic language classes at Tufts. What did you do before Fletcher? 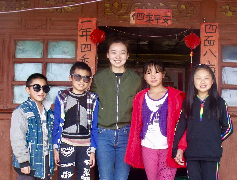 I taught English in rural Yunnan, China for two years. I was also actively involved in teachers’ training, and education projects that brought educational resources and activities to campus. I was born and raised in Changzhou, Jiangsu Province on the east coast of China. I completed my high school and college degrees in Minnesota, U.S.
What is your favorite, most unique place you have ever been or traveled to? I really loved the national parks in Maine when I visited. Chinese writer Lu Xun; Japanese writer Haruki Murakami. What has been a challenge you have faced during your career or time at Fletcher? What has been your favorite moment at Fletcher so far? I love engaging in stimulating conversations with my classmates, and to be able to see the same problem from different perspectives. I am concentrating in International Security Studies and International Negotiation and Conflict Resolution. In particular, I am interested in U.S.-Russia relations and U.S. policy towards Russia and Eurasia. I worked as a 5th grade Language Arts and Social Studies teacher in rural eastern North Carolina through Teach For America. I taught for three years alongside my husband, who is also an alumnus of Teach For America. I was born in New York, but moved down to Spring Hill, Florida when I was still a baby. I grew up in Spring Hill, which is north of Tampa, and I definitely love orange juice and the Florida Gators! When I was traveling to Russia for the first time, I had the opportunity to visit Yasnaya Polyana which is the museum-estate of the Russian writer Leo Tolstoy. It was surreal to be walking around the estate, especially after having just read War and Peace. My favorite writers are actually children’s novelists, which stems from my time as an elementary school teacher. I loved Roald Dahl, J.K. Rowling, and Shel Silverstein as a kid and enjoyed reading from their books to my students. Who has been the greatest inspiration in your life? My husband Brian has been my greatest source of inspiration. We have been together and have been best friends for the past seven years. He motivates me to step out of my comfort zone, supports me when I am lacking confidence, and pushes me to achieve my goals. Having him as a partner has positively changed my perspective on life, and I will always be grateful for him! I know this question asks for a “person,” but I would have to say both of my parents. They have worked so hard their entire lives to raise five (yes, five) determined, successful, and incredible women. Their sacrifices for my sisters and me have no bounds, and they are the reason I am pursuing my career goals at Fletcher. Now that all my siblings and I are finally out of the house, I hope they can get the rest and relaxation they finally deserve! The biggest challenge I have faced during my time at Fletcher has been prioritizing what is important to me. There are countless guest speakers, book talks, information sessions, club meetings, and library workshops that all tend to overlap. But then you have to focus on what you came to Fletcher for and make sure you complete your readings, meet with your professors, attend group meetings, and submit assignments. Finding a balance between what is important to me and what is necessary is a struggle, but I am grateful for the abundance of opportunities at Fletcher. Some of my most favorite moments at Fletcher have been performing at the Fletcher winter and spring recitals. It always feels wonderful and gratifying to work hard on a song with a group of friends and see your work pay off during the performance. It is also beautiful to see the variety of talent that Fletcher has in its faculty, staff, and student body. I am a PhD candidate in Development Economics and Econometric Impact Evaluation (self-designed field). Prior to coming to Fletcher I worked for four years in grassroots development in the Dominican Republic and Haiti, both as a Peace Corps Volunteer and working for a small local non-profit. I did my MALD in 2010-2012 and then worked as an economist for three years at the World Bank, where I designed and implemented several randomized control trial evaluations on public health and access to justice programs in Peru, Ecuador, and Colombia. I grew up in Boston, MA in Roslindale and Dorchester. There is a beach within a national park on the Dominican-Haitian Border called Bahia de las Aguilas. It is a pristine beach formed where a desert meets the Caribbean. The water is turquoise and the white sand feels like it goes on forever. I mostly read non-fiction, so I don’t have a favorite author, but I love reading about the history of civil disobedience and organizing efforts in the U.S., and also more recently about psychology. My parents for sure. Both are social justice activists, my dad in the labor movement as a union organizer and my mother working on a host of social issues in Boston, from public childcare to immigrant and refugee services, all while finding their way to raise a family in the city. Listening, day in and day out. I am privileged to be working and researching in international development. With that privilege comes a deep responsibility to listen and then use the tools I have to make those voices heard. I do this through large quantitative surveys designed with input from people working on the policies I evaluate. The other thing I am most proud of is that I really try to bring my values of social justice into all the work I do, whether that is through representing PhD students in the PhD committee here at Fletcher and working for better stipends, or organizing short-term consultants for improved labor conditions at the World Bank. If we don’t live the values we promote internationally in our own lives, what are we doing? Ecuadorian moms and dads making it happen every day for their families while living in poverty, victims who are brave enough to come forward in Colombia and start to build peace, Haitian entrepreneurs still hopeful despite so much hardship, Dominican families that give meals away even when they don’t have much. Getting by financially, juggling working and being a student. The other big challenge has been figuring out what I want to do when I grow up, which I have decided may just be a question that I will always carry with me. Throughout my time at Fletcher my favorite moments have been sitting in class feeling fully inspired by my female economist professors. As a MALD student, dancing in Fiesta Latina and playing Fletcher Fútbol were also unforgettable moments with the awesome Fletcher community. What do you teach at Fletcher? International Humanitarian Law and International Criminal Justice. I’m currently deciding on the subject for my third course, which will be offered for the first time next year. Immediately prior to Fletcher, I taught at University College London. As a lawyer, I feel compelled to point out that this question poses grave interpretive difficulties. In the absence of an overlap between my favorite place and the most unique place I’ve been or visited, it’s tempting to think the question has no answer. That can’t be what the drafter intended. There are, of course, ways other than overlapping in which “favorite” and “most unique” could interact in their modification of “place.” However, the structure of the sentence doesn’t privilege one over the others and they each militate in different directions. What, then, is the essence of the question? Read in the context of the project overall, and informed by the nature of the other questions, it seems to be to understand something about me through my relationship to place. Since the “most unique” category says more about the place and the “favorite” category says more about me, I expect that the latter is the dominant request. For reasons to do with the personal emotions they evoke, my favorite places are the Marin Headlands overlooking San Francisco and the Pacific, Delft in the Netherlands, and Clissold Park in London. A collateral side effect of this answer is that it should give you an idea of what it’s like to sit through one of my classes. Parenting. So far (he’s only two). If you were to go over answers to this kind of question from a few years ago, I’d wager that Aung San Suu Kyi would have been among the most popular. Admiring an individual, rather than admiring an individual’s realization of a specific virtue in a particular context, sets one up for disappointment. I see friends, family, colleagues, and students exhibit virtues I admire all the time. Among those that most inspire my admiration are compassion, curiosity, integrity, and resilience. The perennial challenge is re-examining an idea or an argument that didn’t work. It’s a fantastic feeling when students have grasped a complex idea and are debating its merits from a position of mutual respect. I’ve been fortunate to have several moments like that in my classes. What do you do at Fletcher? I am the associate director of library services at Fletcher. In that role I help to provide oversight for reference and instruction services, collection development (selecting and purchasing materials), and access services (circulation and document delivery). I regularly meet with students and faculty to assist with research projects and teach a variety of workshops on research strategies and library resources. I also serve on a number of Tufts library-wide committees. Before Fletcher I held similar roles at other universities. I came directly to Fletcher from the libraries at the University of Rochester in New York, but prior to that I managed the library for the Schar School of Policy and Government and the School of Conflict Analysis and Resolution at George Mason University in the Washington, DC area. I am also an alum from the Schar School. I am originally from the “mitten state,” AKA Michigan, but have lived and worked in Chicago, western New York, and Washington, DC over the years. Indonesia — more specifically Java. I traveled around Central Java a number of years ago, and found it to be geographically beautiful with a rich and complex history, amazing people, spectacular art and culture, and incredible food. It may be trite to say, but my mother who just passed away last summer. Parenting is such a difficult yet rewarding task that I’d put it high on my list of greatest achievements. Time is always a challenge, but there are so many wonderful people at Fletcher that I wish I had the time to get to know better. I really enjoy participating in the Annual Faculty and Staff Wait on You Dinner, so I think I’d go with that. That said, I brought my kids to the Reunion weekend clambake last year and that was a lot of fun, too.